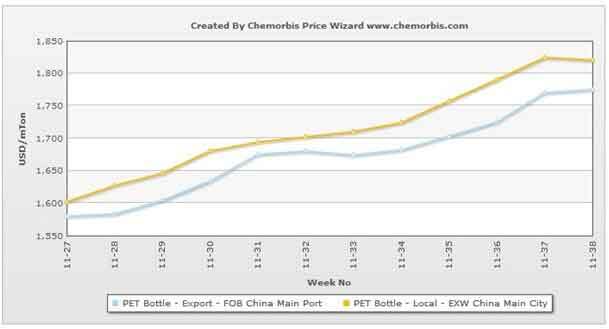 In Asia, PET prices have edged up over the past week, pushed up by higher upstream costs as per the pricing service of ChemOrbis. 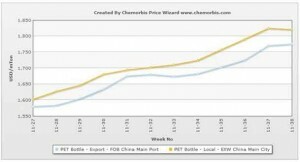 Spot MEG prices in the region climbed around $25-30/ton on the week due to firmer PTA futures and crude oil prices. Crude oil futures for August delivery on the NYMEX climbed around $3/barrel over the past week after hitting a 15-month high on July 10. A Far East Asian producer raised their export PET prices by $10-20/ton from last week, pointing to better demand in China besides firmer upstream costs. “We don’t expect prices to post major increases as large buyers have already secured some cargoes. We aim for modest hikes in line with the rise in upstream costs,” a source from the producer commented. KIEFEL Press Release to International Trade Fair "K 2013"